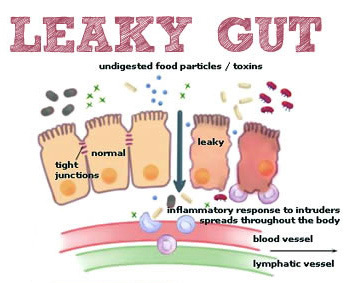 You have heard it from me time and time again that the gut has a huge influence on the rest of our body, especially our immunity, our hormones, our mental health and skin health. Many common symptoms that I see in my practice start in the gut. Whether you have an issue with depression, eczema, an autoimmune condition or simply been diagnosed with IBS, this system to treat the gut is a great place to start. IBS, or irritable bowel syndrome, is an umbrella term covering MANY issues that could be going on including leaky gut. With more questioning, a proper abdominal exam and perhaps more testing, we can usually determine the underlying cause of your IBS symptoms. Have you been told you have IBS and you just have to live with it? Fear not, as there IS something you can do. Your digestive tract is lined with a thin layer of cells called enterocytes that are connected by tight junctions. These cells regulate what gets absorbed from your digestive tract into your systemic body. When these cells and tight junctions are damaged, from medication, stress, an imbalance in bacteria, irritating food, etc., they are no longer able to regulate proper absorption and either local or systemic problems arise. It is important to take away the issue first, at least until the gut is healed. This could be stress, food sensitivities, determined by an elimination diet, or bacteria or yeast that has run rampant in your gut. Some testing such as a comprehensive stool analysis or SIBO test may be necessary. It is common with prolonged stress or use of antibiotics or other medications digestive enzymes and stomach acid are low. In order to aid in proper digestion it is important to stimulate these digestive juices. Simple foods hacks may work such as warm water with lemon and ACV (in small amounts), or a complete digestive enzyme may be necessary. This means adding the good bacteria, or probiotics, back into your gut, especially if you have been on antibiotics. A good quality probiotics with specific strains is helpful and/or eating fermented foods such as kefir, sauerkraut and kimchi. I love the local company The Cultured Coconut Kefir. This is often the step that is missed most but I find is the most important in maintenance of proper digestion. Even if we take away the initial cause, if the cells are still damaged you will have to continue to be very careful with your diet and lifestyle. I focus on supplements and herbs such as omega 3s, glutamine, collagen, aloe, DGL and zinc. These are taken for up to 6 months for some. If we have taken you through these 4Rs in practice and you are still having digestive issues, or systemic issues for that matter, that is an indicator that more testing may be needed to determine the cause and a more specific treatment plan is necessary. Have you been diagnosed with IBS or have any of the above symptoms and do not know what to do? Come in for a free consult to decipher whether a protocol like the 4Rs would be helpful for you.